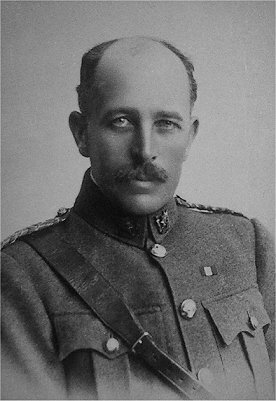 Commanded the 3rd Battalion Worcestershire Regiment from 1908 to June 1912. Colonel Peacocke was born near Dublin, Ireland in 1865. He first commissioned into the 5th Dragoon Guards in August 1884, but after a short time he transferred to The Worcestershire Regiment. He was seconded for service with the Army Service Corps, rejoining the Regiment in 1887. On home service with the 2nd Battalion at Pembroke Dock until posted to the 1st Battalion in India. He served with that Battalion at Poona, Kamptee, Rangoon and Aden, coming home with them to Tregantle Fort, Devonport, in 1896. In 1899 he was seconded for service with the Egyptian Army and was on active service with them against the Kalifa in the Nile Expedition. He rejoined the 1st Battalion at Templemore in 1903, having reached the rank of Major in 1900 whilst seconded. Having been posted to 2nd Battalion as 2nd-in-Command, he joined them at Bloemfontein, Orange River Colony, in 1904 and moved to Ceylon with t hat Battalion at the end of the year. After two years at that station, the Battalion moved to Ahmednagar, India, where he served until 1908, when he was promoted to Lieut.-Colonel and appointed to the command of the 3rd Battalion for the next four years at Wynberg, Cape Colony, Dover and Tidworth. In 1912 he retired on completion of his command. In August 1914, when the First Great War broke out, he was re-employed and appointed Officer in charge of Records, Lichfield, where he remained until 1921, and was awarded the O.B.E. for his services. Lieut.-Colonel Peacocke was always a keen sportsman and went in for big game shooting, pig sticking and polo, playing for the Regiment in India and Ceylon. After retirement he lived for a great many years at Crowthorne, Berkshire. Shortly before his death, Lieut.-Colonel and Mrs. Peacocke moved to Leatherhead, where he died on 17th January 1952, age 86. A Memorial Service was held at Sandhurst Church on 22nd January 1952, at which Lieut.-Colonel S. A. Gabb, O.B.E., M.C., and Major W. A. M. Chippendale represented the Regiment.